The Dawn of the Age of the Mandoline | Come Due Maiali / "Like Two Pigs"
I am not a serious cook the same way we are not serious hikers. The issue is the same, – total lack of professional-grade gear and equipment. The biggest reason for that is that I am not a gadget person. On top of that, I have low risk tolerance (most uncharacteristic for a finance professional!). Among many other things, it manifests itself in my apprehension about new kitchen appliances. As a result, my kitchen is VERY low-tech; you will not find any pressure cookers, KitchenAids, sous vide ovens, and not even a coffee maker. We use a French press and a hand-cranked German coffee bean grinder, which I think is way cooler than the fingerprint-recognizing espresso machine or robot tea infuser (ok, maybe not). Once ubiquitous computing becomes, well, ubiquitous, my kitchenware will be left behind in the Stone Age. My computer will not want to talk to my toaster oven from circa 1990’s. To continue, inexplicably I own no risotto pans, or crepe pans, etc. and insist on cooking all soups and stews in a scratched-up $20 pan, bought at a grocery store years ago when I found myself assembling kitchen essentials on a non-existing budget. I salivate over beautiful copper pots and can afford updating my equipment, but for some reason, I don’t. I don’t know if I am afraid that “the magic will be gone”, and that wielding new pots and pans, I will find myself unable to boil water, like when I was 19. Knives (almost exclusively Global) are the only expensive and updated items in my kitchen. Last week I took a huge leap a baby step forward, and purchased a mandoline slicer. However, terrified by graphic reviews that suggested I needed to invest in a rubber “no slice” body suit prior to using it, I cleverly got out of using the mandoline for the purpose intended, i.e., for slicing the truffles. A week later, I finally screwed up the courage to put my newly acquired mandoline to use. A nice twist on a comfort food dish. I layered thin slices of root vegetables in the Pyrex dish with a bit of saffron-infused heavy cream sauce, a splash of white wine, and shredded sheep’s milk cheese on top, and put it in the oven at 375F for around 20 min. We washed down the gratin with a 2006 Jean Rijckaert Arbois. The saffron sang in unison with the minerality, citrus, and especially the spice and exotic floral tones that have developed as secondary characteristics in the 6-year old Burgundy (Jura white, to be precise). The French have long known of celeriac’s pleasures and routinely serve celeriac slaw as a classic bistro side dish, but it is still waiting to be discovered in this country. The smoked sturgeon, horseradish, and celeriac slaw appetizer I had Wednesday night at the brand-new Mintwood Place restaurant in Adams Morgan left me a bit disappointed but inspired. 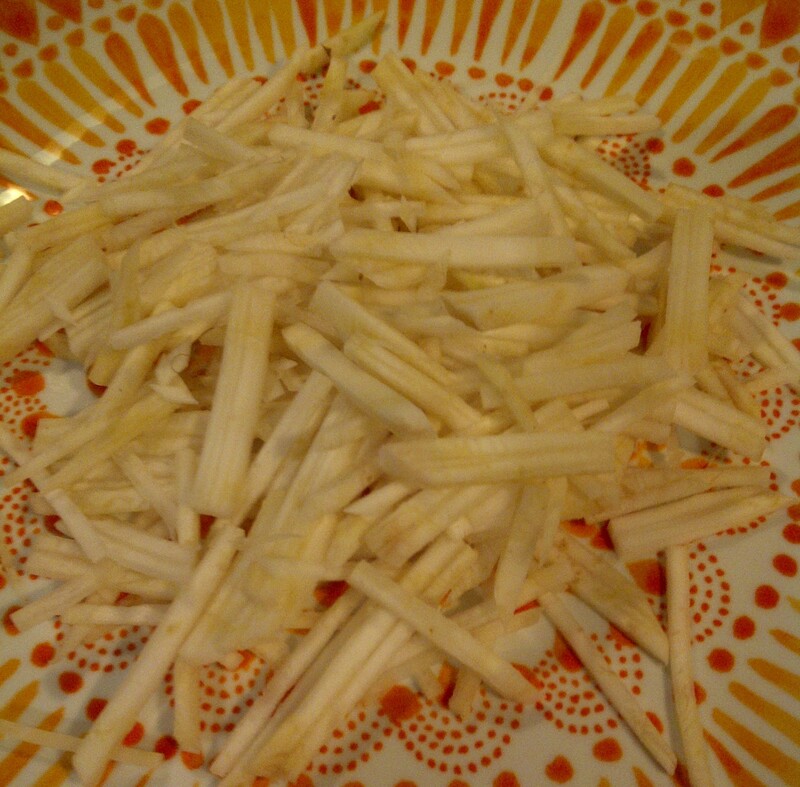 Celeriac slaw, or céleri rémoulade, is shredded celery root tossed in a mayonnaise-based sauce, usually flavored with a little bit of mustard and acid, like lemon juice or vinegar. I felt the dish was a bit too mayo-heavy, and limp, and I wanted to see if I could improve on it at home. Naturally, the mandolin slicer is the perfect tool for making a slaw! The problem is, I don’t like mayo, and Jeff (my husband) does not like mustard. My solution was to use sherry vinegar, butter, lemon juice, and ponzu sauce. I cooked shitakes in butter and a nice aged sherry vinegar, with parsley, herbes de provence, and salt & pepper, and roasted parsnips in the oven for 12 min at 400F (pre-seasoned with olive oil, salt & pepper). And for dessert – a shot of Buddhacello. Friday marked exactly 4 weeks since the beginning of the experiment. To continue with the root vegetable theme, I will be making rutabaga with crème fraiche, cardamom and ginger later this weekend. Stay tuned! 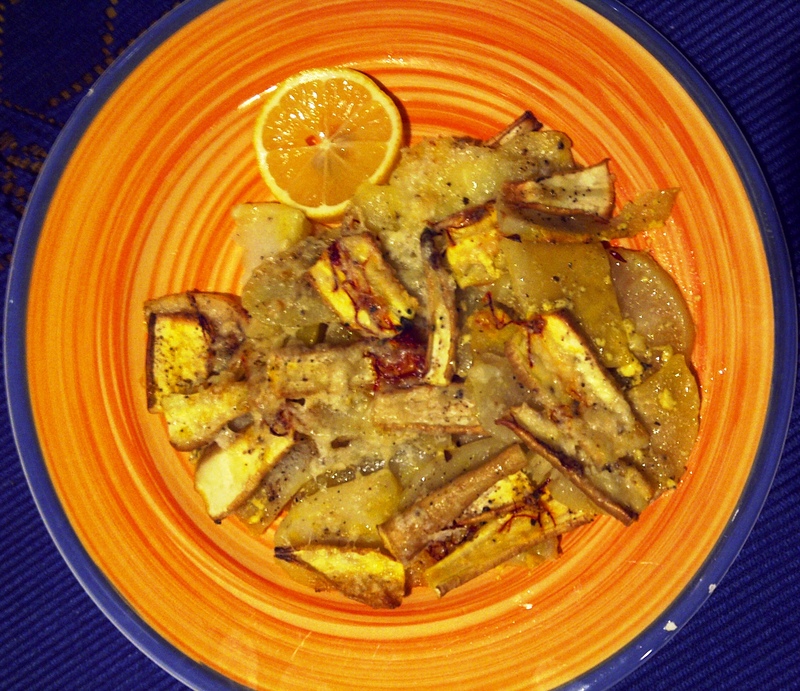 This entry was posted in cooking, food, food & wine, recipes and tagged celeriac slaw, gratin, Jean Rijckaert, mandoline slicer, parsnips, root vegetables, turnips by Come Due Maiali. Bookmark the permalink. 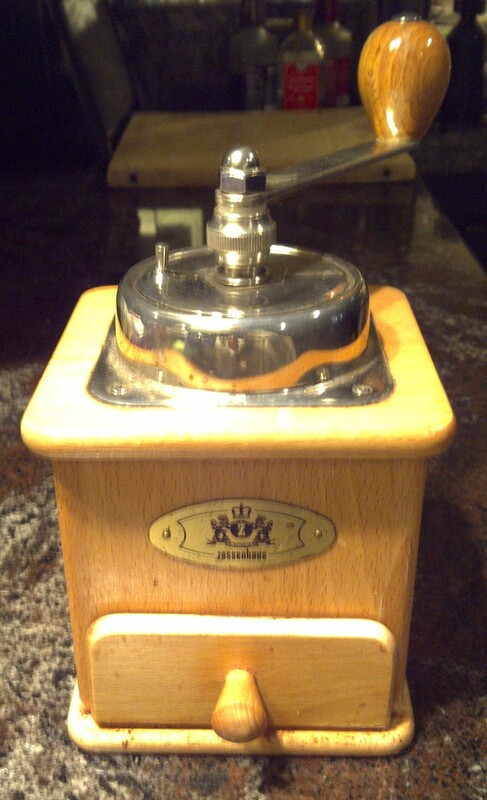 Used to have a mandoline (as well as a hand-crank coffee bean grinder), but was too nervous to use it very often. The one thing I can’t live without is my mocha maker. The tools I use to cook the most is a fork and standard steak knives. When I’m done cooking all sorts of things, you will find lots of soiled knives and forks in my kitchen. It does not matter which tools you use as long as you are happy in your kitchen and as long as you make new discoveries. You make me laugh so much N! My All-Clad chef’s pan was a gift in 1998 and will cook another 25 years with ease (likely way more) My cast iron skillet was a wedding gift to my grandparents in 1943 and it is quite simply phenomenal. Temperature control is the key to so many foods, and the better the pan the greater the degree of temp control in your cooking. You may have adjusted yourself to your pans of lesser pedigree and I remain confident were you to upgrade at least a few of these items you would cook for months on end with a silly grin on your face. Besides, right now you are rocking a little culinary hypocrisy with those Global Knives and that Micro-Plane. Kitchen gadgets are like chocolate, wine, and orgasms yet they have much greater longevity. When I started this blog, little did I know I would be getting advice on orgasms. How awesome! They don’t call me The Blissful Adventurer for nuttin’.. Most of what I have in my kitchen are hand-me-downs from my husband’s grandmother. We’ve upgraded when we needed to, but there’s only a few fancy things that are really necessary. One of those is our food processor which thankfully has a mandolin application on it so my fingers are safe. The slaw looks great. Love your dressing! I have a ridiculous amount of gadgetry and small appliances in my kitchen. Emulsion blenders, food processors, pasta sheeter, two crock pots (and I use them both), one of those Baby Bullet things (haven’t used it yet), and who knows what else I’m forgetting. My collection is always growing. I may have a problem and should seek help. I don’t have a mandoline, though 😦 Nice post! It’s not surprising to have too many tools. I would expect men that cook would tend to acquire way too many kitchen gadgets. It’s in your DNA. For me there are two keys to equipment. The first is cast iron. I love the way a seasoned cast iron pan distributes heat. And it is also the best kind of nonstick. A variation on this is a hammered metal wok. More than just the engine for a stir fry— it is great for deep frying small batches of whatever with minimal use of oil and combined with a bamboo steamer, you can’t beat it for allowing free flow of creativity in the kitchen. Lastly, but most importantly these are very affordable. The second is knives. I am forever trying new ones and have filled two knife blocks with them. But my pride and joy is the forged iron meat cleaver I used to watch my grandmother use. This may sound strange, but I can actually feel her spirit everytime I use it. Perhaps that just the halo of remembrance. I, too, love my knives. Wonderfully entertaining blog you have here, bella! Thank you for swinging by mine and commenting. I’m glad I followed your link back to here. I totally dig the lack of gadgets thing. My big expense was this amazing Cuisinart 14-cup food processor that is even now smiling at me as it sits on my kitchen counter. But I tend to keep things low-end, price-wise that is, and use what works. The Cuisinart processor is something I had used elsewhere, I liked it, I found it at Bed Bath and Beyond, and I bought it. Simple as that. Expensive tools have never made the culinarian. The culinarian can take the cheapest of tools and make the richest of meals, however. I like how that pans out. Great post!! I too have a pretty minimalist kitchen and suffer the comments from family and friends when they try to help me in the kitchen on holidays. I go to the Mother-ship of Williams and Sonoma just to drool over all the gadgets! -Wait, aren’t you the family that adopted a Cuisinart? Thanks for stopping by my blog. I use my mandoline all the time. 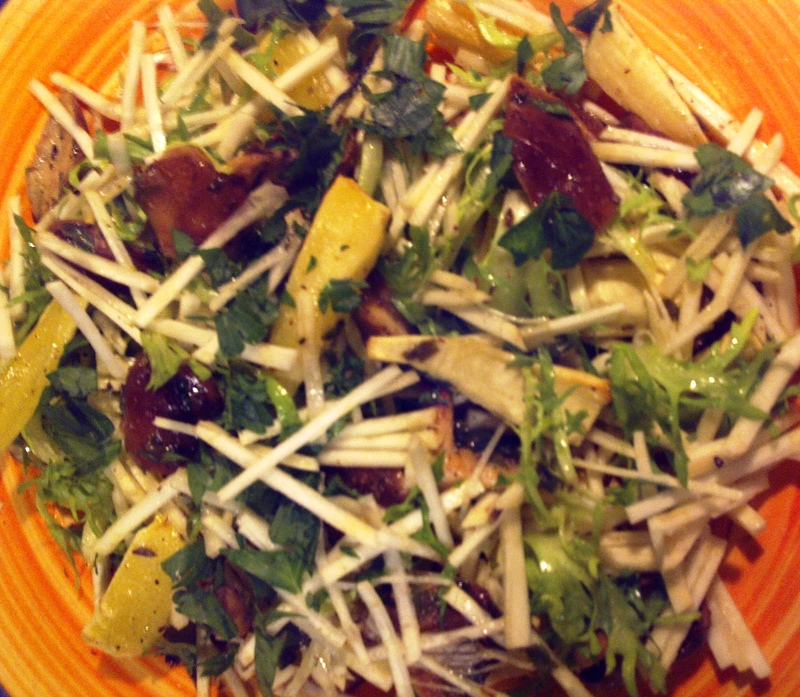 Your shiitake mushroom salad looks great! Thanks! It would go beautifully with your acorn squash, sweet potato, and kale soup! Mandolines aren’t the highest priority until you realize how cool they are… try beet carpaccio with an orange vinaigrette… You just can’t slice those beets thin enough with a knife! A beet carpaccio sounds awesome! Now that I have a mandoline and my brave sous-chef (a.k.a. my husband) has proven himself willing to do the slicing, the sky’s the limit! I have cooked for years and years and years. Over those years I honed my knife skills, of which I am quite proud. My wife bought a mandoline (V slicer) and uses it frequently. It is fast, gives you consistent slices, dices, juliennes and for some tasks is the best choice of tools. Given I hate to cut myself while rapidly passing my hand over exceptionally sharp razor devices, I, too, worry about using a mandoline (Of course I have a 12″ professional deli slicer which probably makes no sense). To get over my inherent fear of mandolines, I bought a slicing glove. 😀 It works great! You might want to see if you can find one. There are inexpensive and definitely give you piece of mind playing with kitchen toys like a mandolin. I like your blog and glad you dropped by mine. I had to look for a photo of a mandolin slicer; does it go out of tune like a guitar? When we bought our house it came with a high falutin’ convection oven and glass cooktop, both of which I can barely operate. They’re both electric, which I despise. Gas cooking is my weapon of choice — I want to see FLAMES when I turn that dial! One of the cooktop burners has died and I refuse to get it fixed. I guess it’s a good thing that only my husband and I have to exist on this 3-legged dinner dog; if we had kids they’d be starving. Or eating at MickeyDs. Just tame. Or else it will eat human flesh with its razor-sharp teeth.